February 10, 2014. PRAVMIR. 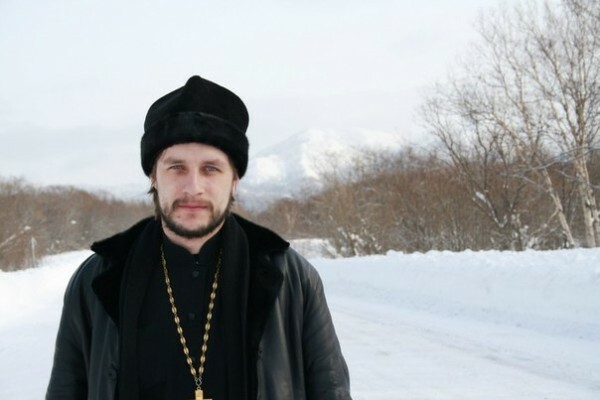 The average homeless man Vladimir Zaporozhets, who stood for whole days on the porch of the Resurrection Cathedral in Yuzhno-Sakhalinsk, turned out to be the only one not afraid to stand up for the faithful in the church. He sacrificed his life to shield the parishioners. Archpriest Viktor Gorbach, the director of the missionary department of the Diocese of South Sakhalin and Kuril, told the publication KP that this person was well known in the church. He was in a difficult life situation and therefore often stood begging on the porch. “An amazing person: having heard gunshots, he went to defend the church. This action changes our attitude towards people with no fixed abode. After all, many people consider people begging on the porch to be worthless people. But one of them stood up in defense of the church. That’s a real feat [podvig],” Archpriest Viktor Gorbach shared. The priest also related that he himself had received threatening messages from Stepan Komarov. In particular, the future killer called Christians cowards and worthless people, promising to deal with them. Then he disappeared. The church’s clergy and all the faithful also mourn the brutal murder of the Nun Liudmilla. She was the first to alert the authorities to the attack on the church, not leaving it with the majority of parishioners. When the gunman shot her in the head, she did not even cover her face with her hands. “Matushka Liudmilla (Priashnikova) performed a heroic deed [podvig]. She called the police and reported the incident when a crazed, armed offender was in the church – that takes its share of courage. She remained in place until the end, in the line of duty. Therefore the question of canonization will be raised,” said Archpriest Viktor.